For six years, approval of the Keystone XL Pipeline has been held up in Washington as the project morphed into a test case for the future of energy in the U.S.
Now, a Keystone vote is back on the table in Congress. While Republicans have usually been the project's standard-bearers, this time it's Democrats who are pushing the issue, in an attempt to save the seat of Sen. Mary Landrieu. She faces a run-off election next month in Louisiana, where the oil industry looms large and the pipeline is popular. Progressives still can't stand the idea of promoting fossil fuels amid a climate-change crisis, and they would be shocked if President Obama, who just signed an emissions deal with China, approved this latest proposal. 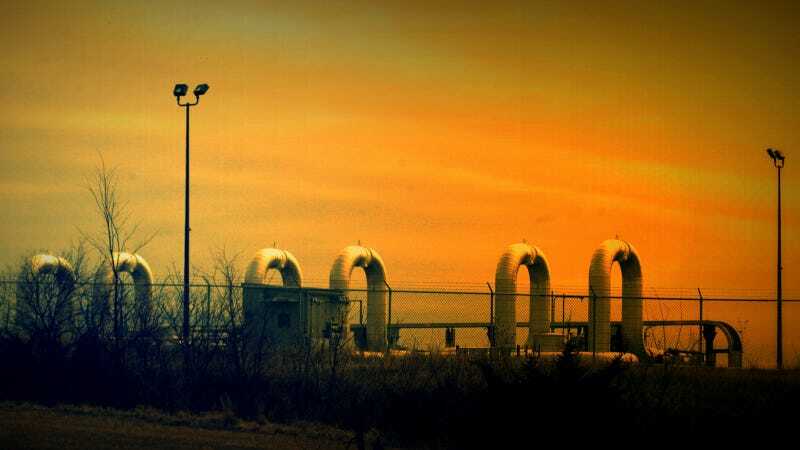 But TransCanada, the Calgary-based energy company behind the Keystone, has insisted the project would create about 9,000 construction jobs, boost U.S. economic output, and bolster North American energy independence. We reached out to Shannon Patrick Ramos, a 39 year-old amateur photographer who lives in Nebraska with his wife and two children. For the past few years, Ramos has been posting photos of the first version of the pipeline as it was built and completed near his town. We asked him to describe what it was like living with the Keystone. His remarks and photos are reproduced below. We live in a small village Swanton, Neb. population, 98. A year or so before the project started a man rented the house across the street from us. His name was Tom. He was a foreman for Trans-Canada from Kentucky, he told us about the plans. The pipe was brought in by railroad to a small village a few miles to the south of us called Jansen. There was a lot of hype going around about the project bringing many people and jobs, which would have a large positive economic impact. Many small businesses had signs out saying "Welcome Pipeliners" as in my photo. The construction was fast and in such rural areas it did not effect traffic at all, and the next year after the pipe was laid the farmers had corn growing and it was totally inconspicuous. But after the project started mostly everyone was underwhelmed by how little business it brought. It did not bring any jobs to our small village, and not many jobs to the area, as many of the workers moved along with the work. They rented places to stay in the larger towns of Fairbury and Beatrice. I see no environmental impact from the pipeline at all, as it's underground and the land continues to be used for farming as before. It's only visible where it crosses rivers and streams and at pumping stations. Most people in our area are used to it, and many would have a difficult time locating it or pointing it out. I don't think a breakdown or leak seems likely or imminent, but I'm aware that the high number of times a pipeline break has occurred in the U.S. and this is very concerning. I am also highly concerned by the historically inadequate monitoring systems currently used and the fact TransCanada is not willing to spend money to upgrade it. I do not think the last stretch of pipeline should be approved for many reasons. The Nebraska Farmers Union has repeatedly spoken against the unethical tactics TransCanada used to bully and intimidate land owners by threatening to seize their land under eminent domain, giving them 30 days to agree to sign easements. Tax records show TransCanada did not deliver on promised tax revenue in Nebraska. In Kansas, TransCanada is exempt from property taxes for a decade, which will cost their state $50 million in public revenue. People in our area generally feel mislead by all the positive claims that were hyped for the Keystone 1 pipeline by TransCanada and our local politicians and we have seen no accountability from either. So I agree with most all of my neighbors and think it is clear this project will only benefit one corporation and our ambitious politicians.